The future is shaped by our choices and actions – meaning that we are all active change makers. Navigating complexity is one of our biggest challenges and majority of brands globally are perceived to have a notable little impact on our sense of wellbeing. The call for organisations to rethink why they exist and why people will want to engage with them is urgent. 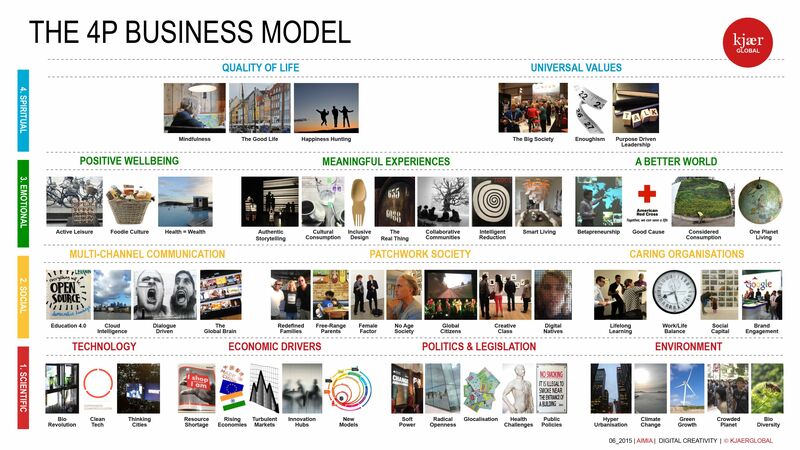 Kjaer Global’s 4P business model and Trend Atlas (see diagram) helps organisations realign themselves for the challenges ahead. While the 20th-century was all about left-brain thinking, focusing only on P for Profit, the 21st-century requires a far wider definition of success – one where balancing Profit with People, Planet and Purpose will foster sustainable success. At Kjaer Global, we study all layers of society – Scientific, Social Emotional and Spiritual – enabling us to tap into future risks and opportunities. We have defined a shortlist of eight key trends from all four dimensions currently influencing people’s lifestyle choices, as well as society and business, globally. While we deal with them individually, they are all interconnected. The Digital Transformation is not a destination, but a journey where technology is an enabler. High performance will be a given in order to create profit. While 50 billion devices are predicted to be connected to the IoT by 2020, the real value comes when organisations build creative solutions. Real-time big data is already solving urban problems in global centres such as New York. Future cities will be intelligent networks, connecting people with buildings, goods and services. Developing user-centred communications, adaptable to multiple devices and channels, is key to ensuring engaged and thriving communities. People and businesses now aspire to do good through participation and collaboration and this culture of Betterness is inspiring us to rethink human exchange for the good of our Planet and community. The Circular Economy will transform traditional business models, using real-time data to deliver better customer experiences while also doing good by reducing waste and pollution. Access and sharing will grow in importance, enabling us to rent, rather than buy, almost anything. This will build social capital as community-minded networks come together to reduce their impact on the environment. Transparent organisations are well-placed to make a positive difference to people’s lives, and will be recognised as having a clearly-defined purpose. Put simply, reputation is the most valuable currency of business. 2014 was the ‘Year of Mindful Living’ – with The World Economic Forum, Harvard and Silicon Valley joining in the conversation about mindful leadership. As the head of mindfulness at Google Chade-Meng Tan put it succinctly: “Goodness is good for business”. As conventional measures of success are redrawn, organisations need to start connecting the dots. 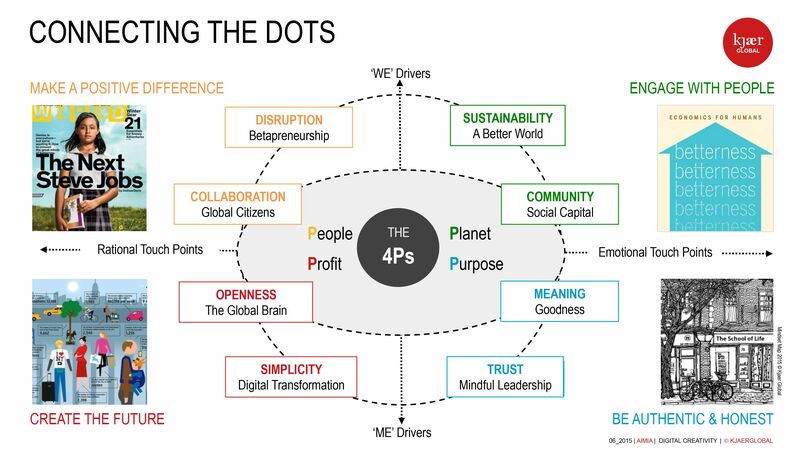 This 4P model is already shaping tomorrow’s people, the digital economy and the Smart Society and is the fuel business needs to inspire collaborative ventures, innovative ideas and sustainable growth. It’s liberating to remind ourselves that we can all be active change-makers when we take control and ownership over the future through our choices and actions. Meaningful engagement is key to success in the 21st-century, and winners of the future will be those organisations that are agile enough to adopt the 4Ps. Anne Lise Kjaer is a futurist, and founder of the London-based trend forecasting agency Kjaer Global, working with leading global organisations. She is also the author of The Trend Management Toolkit – A Practical Guide to the Future, published by Palgrave Macmillan. You can follow her on Twitter, Facebook and the Global Influences Blog.